Just in case you were beginning to think that I spent my entire holiday taking photo's of people when they weren't looking - well, I did. No, I jest. 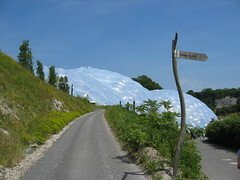 I had a day off from photographing weirdo's and took my son to the Eden Project one day while him indoors went deep sea fishing. The day we went was boiling which made the project look even more exciting. It glistens against the landscape like a James Bond style evil baddies space-station. It is extremely well designed and planned. The people who work there are really friendly. As an educational tool it is brilliantly inspiring but you can also just as easily go there and 'hang out' as opposed to being forcibly educated. Here is a link to their main site. Oh - they have two restaurants which are excellent. Fresh proper food - no serious junk and all locally sourced where possible plus a bar for thirsty grown-ups! If that's not enough to make you want to go - they also stage live music there - apparently Ian Brown and Embrace are playing next month. Pretty cool. 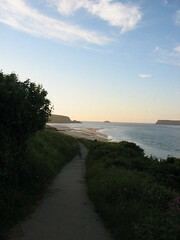 See more photo's on my flickr photoset of a week in Cornwall. Well, each to their own but I couldn't resist a shot of this man on the left - the one wearing a complete copy of the Pink Floyd album cover Dark Side of The Moon on his shirt. I am ashamed to say we smirked quite alot which was really quite pathetic as we have a combined age of 84 between us (I am the younger and evidently more childish one!!). Any die hard fans - you get them from here and they are £33.99 incl. vat!! 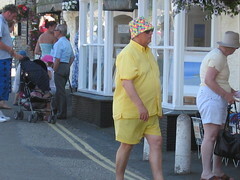 Saw this on the quayside at Padstow. 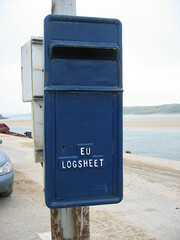 I think it might be a post box for fisherman. Something to do with declaring how many fish caught/how many hours been fishing as part of some bizarre EU directive? Not entirely sure. Any ideas anybody? Reminded me of something you would see in an Ealing comedy film. In tune with the solstice we found ourselves in an unspoken Close Encounter style frenzy and created a sandcastle with a difference. Just as we left the beach a toddler ran up and sat on the main arch and knocked over half of it much to the rage of our four year old. 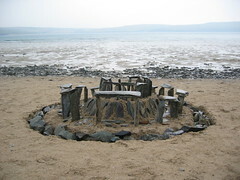 Oh well...henge rage in Cornwall lives on. 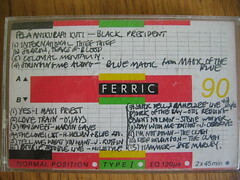 Continuing this week's theme of the audio cassette - this site is for serious audio cassette buffs. Project C90 is a beautifully curated on-line museum dedicated to the C90 cassette. Truly fabulous and worth a look. 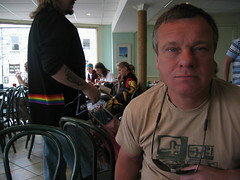 The picture is one of mine - I need to check what's on it as it didn't originally belong to me. My ex-boyfriend left it when we split up - I don't know who scribbled out the title. 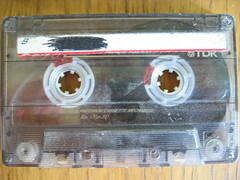 Here's another one - this was taped off the radio - UK rapping/human beatbox championships. It was cool. Soon these little critters will be completely obselete. There has been a small and interesting discussion over at never trust a hippy recently about mix tapes, how we made them and what emotions they evoke. I've got a big bag of them in my loft and found a smaller one at the back of the airing cupboard this morning! 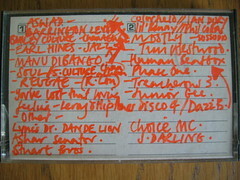 This particular tape I stole off my mum. 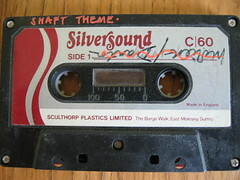 She had taped something classical on it swiftly replaced by pirate radio and the Shaft theme which I had just discovered. 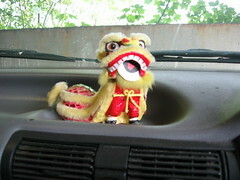 Anyway, this is our van mascot - he sits on the dash and stops us from crashing and helps us find good parking spaces. My son calls him Banana Head but he is only four so he's allowed. I put the picture up because I like it. Anyone remember World Of Twist? A fabulous band - they were hailed as the Roxy Music of the Nineties but disappeared as quickly as they appeared. Such a shame. Quality Street was a brilliant album but one which unfortunately hailed the beginning of their demise. For a start it was produced by The Grid who recorded it at half volume. I always wondered why I had to turn it up to at least 40 to hear it. They were doing copious amounts of coke and E in the studio and smoking skunk for breakfast which apparently according to ex-singer Tony Ogden meant that they had a few problems communicating with each other. That struck a chord with me as years ago I used to work for a company called Music Box making er...music programmes. We used to have an indie show and would bus around the country each week interviewing bands. We went to Manchester to interview the band when they were recording Quality Street and I remember thinking what hard work and how incommunicative they all were. Now I know why!! It then went from bad to worse - the reviews were undeservedly terrible mainly due to the fact it was recorded quietly - music journo's you should all be ashamed of your whinging selves for that! The band folded and Tony Ogden spent the next few years on smack watching third reich war films (because the good guys won - make of that what you will - he said it not me). He has been glimpsed now and again around Manchester and has just released a 4 track demo from his new band Bubblegum. I bet it's brilliant. Ha ha ha ha ha. 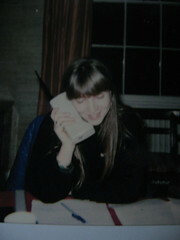 Found this old polaroid of me in 1989 with a (un) mobile phone. I tell you, I was the envy of my business. It was ridiculously cumbersome and had a HUGE battery charger which was the size and weight of a breezeblock. I don't have that anymore otherwise I would have put up a picture of that too. It needed it's own sub-station to get any sort of power out of it and was so big and heavy that it was quite hard to lug around and look professional at the same time. It had squashy plastic buttons that you had to press really hard in order for it to register on the very basic LED screen. If you pressed them too hard then you would get a long line of one number and have to start all over again. I seem to remember that making calls was extremely expensive compared to today's rates and connection was very slow. Those were the days when Cellnet was THE network and text messages had not been invented. I guess pagers filled that gap for a while. Prior to that I used to go around with bags of 10 pence pieces and a fat filofax to make calls when on location. Somehow we managed! Here's a fun link if you are into this sort of thing. I wish I'd kept it now.